Lesser known to many visitors than it's Wiltshire neighbour Stonehenge, Avebury is one of Europe's largest neolithic henges (earthworks of bank and ditch), comprising three stone circles which partially encompass the village of Avebury itself, and is thought to form a connection with other nearby historic monuments of Long Kennet and Silbury Hill. Perhaps due to it size, Avebury's stone cicles did not fare well over the past couple of thousand years after the monument was abandoned around the time of the Iron Age: changes to religious beliefs and the building of the village and its practical needs over time led to many of the stones being removed or destroyed from the medieval period onwards. Thanks to records created in the 17th century before the major part of the sites destruction, the stone circles were restored and reconstructed during the 1930's by archaeologist Alexander Keiller (although some what controversially as this required partial demolition of the village itself). Avebury offers a more 'hands on' experience than Stonehenge as you are able to touch and walk around the stones themselves and see how they link in the landscape to neighbouring neolithic monuments such as the West Kennet Avenue and Long Barrow. 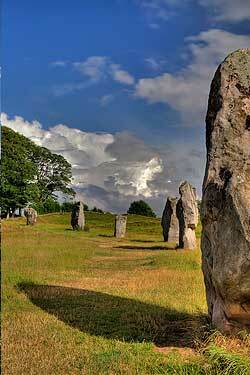 Avebury village is picturesque and a visit to the Manor House and musuem is recommended. Avebury can be visited either on one of Celtic Horizon's suggested tour routes or build it in to a custom tour around your own requirements - contact us for details and prices.